So... here it is. I'm not particularly losing weight at the moment. ;) It's the holidays, and frankly, doing the gluten free thing over Thanksgiving and Hanukkah meant that I missed out on a lot of fun (and feasts). So I'm not beating myself up about enjoying the rest of the month. I even went and baked a crapload of cookies with some other new moms on Saturday - and though I sent a bunch with my husband to work today, we're still enjoying some here at home. "Biggest Loser" is airing again right now, and this season has frustrated me like all the past seasons. ;) I truly hate that the show sets unrealistic expectations for weight loss. If someone "only" loses 4 pounds in one week, they're considered a failure. It's awful. The first week of each season, people lose 20+ pounds, and that just plain doesn't happen. The producers totally manipulate everything - a "week" on the show is often more than 7 days, and I've always wondered about supplement use on the show. I wrote a post back in 2009 about a weight loss supplement that one of the trainers, Jillian Michaels, was selling - it was an insane amount of caffeine, amongst other things. So this week's episode ends with Jillian's team getting a penalty for using unapproved caffeine supplements the prior week. Interesting! Caffeine is a great way to speed up your heart rate, but honestly, I've found it can have terrible effects on the rest of your body. It makes me sad to realize that these contestants are being encouraged to use supplements like that (or, as Jillian claims of the other teams, they're drinking lots of coffee to get that caffeine instead). Anyone who loses weight should be applauded. A mere four pound weight loss in a week is HUGE, and should be celebrated. I wish this show would come clean and be true - actually do the weigh ins every 7 days, show that they are drinking a ton of coffee, explain that they're working out 6 hours a day... it's hard enough to lose weight without having all these unrealistic expectations set on national television. Ahhh, I love macarons. Seriously, love love love. When I was in Paris a few years ago, I went to a half-dozen macaron shops in one day to do a taste test. ;) So yes, I know and love the macaron. Bonus for my gluten free diet: macarons are gluten free! 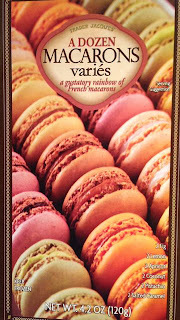 There are few ingredients in macarons - the shells are made out of almond flour, sugar, egg whites and cream of tartar. The filling varies, of course, but is usually a ganache or buttercream or curd - gluten free. So when I was at Trader Joe's yesterday, I saw this rainbow box of macarons in the freezer section and had to try it. lemon: yum. My favorite of the batch. The filling is also a fruit gel but good lemon flavor. apricot: okay. Not much apricot flavor in the shells but very present in the filling (also fruit gel). coconut: good. Coconut flavor is present in the shells and the filling, which is a white chocolate concoction (based on the ingredients). pistachio: horrible! I usually love pistachio pastries, and this was awful. The shells were bad, but the filling tasted like vomit to me. It was so terrible. Ugh. salted caramel: okay. The filling was a decent salted caramel, and the shells had a light caramel taste to them. Today's tasty gluten free item is Canyon Bakehouse Cinnamon Raisin Gluten Free Bread. I found this at Whole Foods and had to give it a try. First impression, before even opening the package, was that this bread is *soft* - definitely not as firm as the Udi's bread next to it. I got home and dove into it, and yes, I like it! Definitely a softer bread, I honestly can't say that it's much different than other cinnamon raisin breads I've had with gluten in them. It's not overpoweringly sweet, which I appreciate. For me, the other nice bonus is that each slice has 2 grams of fiber in it. I'm really missing the fiber I was used to from my former whole wheat days. ;) However, the calories on this bread are higher than the Udi's breads - the nutritional information below is for ONE slice, not the two that the Udi's bread computes. I would buy this bread again and am curious if I'll like other breads from Canyon Bakehouse in the future. So, I've survived the first week of gluten free. I still feel like crap. ;) I knew it wouldn't be an overnight cure, but for me, it's not dramatically improving my quality of life yet. I still am exhausted and have lots of pain and headaches. Good times! However, this also marks the end of my first week back to tracking everything I eat. It's no fun, but I am happy that the free myfitnesspal.com app makes it so easy (especially with the bar code scanning feature). I lost 4.8 pounds this first week. It should've been higher but I went to an all-you-can-eat sushi place last night and had way too much nigiri (no soy sauce or other sauces or tempura either!). I foolishly skipped breakfast both Saturday and Sunday, and that always leads to overeating later in the day. Doh. I'm 6 pounds from my first mini-goal, so hopefully I can accomplish that in the next few weeks! Naturally, I will post reviews of the various gluten free foods I try in this adventure! 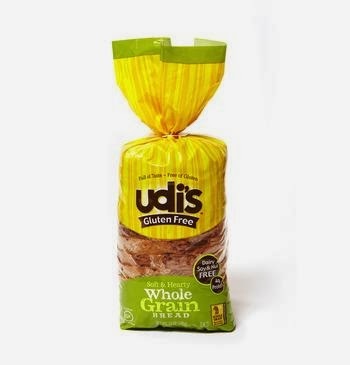 Up first - Udi's Gluten Free Whole Grain bread. I was curious how long I would go before buying a gluten free bread, and that was three days. ;) I picked this up at my local Trader Joe's and tried it yesterday. First thing you notice is the size of the bread - it's small! Each slice is less than an ounce and about the size of my palm. I put my second slice in the toaster oven and I enjoyed it much more (and not just because I added some homemade jam!). For me, it improved with the toasted texture. I give this a vote of recommended, but with hesitation - it's better than other alternative breads I tried when on my elimination diet a few years ago, but it's not as good as regular bread. WOAH. Six years (with varying degrees of posting frequency) I've been blogging here - and woah, that's an eye opener. I've always been overweight. I don't know the numbers, but I'd guess I put on 100 pounds during college and the first few years after graduation. Looking back, I bounced around in a 20 pound range since 1999 until late 2006 when I finally bunkered down and realized I needed to lose the weight. In November 2006, I lost about 5 pounds before Thanksgiving. Then we started a Weight Watchers at Work group, and I also joined SparkPeople.com. Over the next year, I lost 80 pounds. Awesome! That's when I started this blog - 80 pounds down, 50 pounds to go. Woo! I plateaued in 2008 and most of 2009 - despite walking 10,000 steps a day! Ugh, it was so frustrating. I finally lost another 10 pounds in late 2009... and then I had surgery, changed jobs and bought a house - all in the same week. Aie. Unfortunately, the weight came right back on. When I got pregnant, I was basically 40 pounds up from my lowest weight. I was nervous about the gestational diabetes and thankfully did not develop it - but I gained 30 pounds during pregnancy. Honestly, I was proud I was able to keep it to 30 - I only gained 10 in the first two trimesters!! I really tried to keep it under control, but I was on near bed rest for that last trimester and that's when I gained (as did the baby, as planned!). My son was born at 7 pounds and 13 ounces (yes, I had feared that I was going to have a massive baby and thankfully he was average in weight). Unfortunately, I had some pelvic separation during pregnancy and despite trying many things, I still have a lot of pain in that area (and my hips now), which makes walking a long time quite painful. As someone who did the 10,000 steps a day thing for hundreds of days, you can imagine how the lack of walking has stifled my weight loss. Six years ago, when I started this blog, I weighed 53 pounds less than I do today. That's quite a kick in the stomach. Six years ago, I was all excited about my 80 pound loss and figured the final 50 would come with continued effort. Plateau from hell and life interference showed me this isn't easy. ;) So now I start over, yet again. Today's my first day gluten-free - and I'm back to tracking my food. Now I'm using myfitnesspal.com and their awesome (and free!) app. Here we go! Woah, sorry about the radio silence for the past few months! Chasing a toddler around keeps blogging at bay apparently. So here's where we are right now. I need to lose a lot of weight. I have fibromyalgia. I am exhausted most of the time, hungry almost always too, and in varying levels of pain constantly. Awesome, non? My doctor tested me for celiac disease and thyroid disease and some other things, and all of those came back negative (yay!). However, some of the other bloodwork showed that I have lots of inflammation going on (which we've seen increased over the past few years). Also, low vitamin D (which is pretty common). I am down a couple pounds from last week, which is good. I know I would be down more if I hadn't gone out for dinner twice last week and then went to a BBQ-and-pie party on Sunday (and then enjoyed leftovers of the BBQ Monday and yesterday!). It's not merely calories, I know those were higher sodium days than I intended. So we'll see how things go this week. I don't think we have any eating-out plans this weekend, but I know next weekend with the holiday, there will be festivities. As part of my adoption of the Slow Carb Diet, one of the guidelines is to eat 30 grams of protein within 30 minutes of waking up. It's a tall order, especially with a baby to take care of and feed as well. So I'm turning to protein shakes to help with this one. I picked up this Bluebonnet 100% Natural Whey Protein Isolate Powder at my local Sprouts supermarket (it was on sale!). I got the "natural original flavor". 26 grams of protein in each serving! It's supposed to blend easily, but it doesn't for me. I put my cold water in my cup, add the powder, and then shake for 5-10 seconds. I get a lot of foam at the top, and still have clumps of powder in there too. I really try to chug this as fast as I can, and still end up almost gagging about it. It's really unpleasant. I've tried other protein powders in the past, and this one is terrible. I will not be buying it again! I made a "lifestyle change" yesterday and we'll see how it goes. I'm roughly trying to do the "slow carb diet", but I'm not going to obsess about doing it 100%. I think the big thing for me is to try to eat low-GI (glycemic index) foods, since I know I've always had blood sugar sensitivities. When I had my medical procedure last week, I had to fast due to the anesthesia, and right before the procedure, they tested my blood sugar (I had no idea they were going to do that). It was 121. 130 is diabetes, my friends. So I'm kinda "pre-diabetic" at this point, and that is super-no-bueno. I had lost a lot of weight without much exercise, back in 2007. The key then was that I tracked everything using sparkpeople.com. But now it's 2013, and there's got to be a better way! Unfortunately, sparkpeople has an iPhone app, but it's not free so I'm not going to use it. (It's like they purposely designed their web site to be unfriendly to mobile phones as well, to force you to buy the app!) Instead, I have started using the free My Fitness Pal app. So far, I quite like it. Not only do you track your fitness (surprise! ), it has a great food tracking section. You can even scan the barcode of the food's packaging to find items quickly. (Of course, you should be eating less packaged foods, but hey...) It gives you a pre-set nutrition goal (calories/carbs/fat/etc) based on your current weight and goal weight, and shows you progress as you go each day. For me, I'm not focusing on those numbers too much - I know I need to eat less than I was before this week ;) I'm also planning to eat more fiber and less carbs than they recommend. "Rule #1: Avoid “white” starchy carbohydrates (or those that can be white). This means all bread, pasta, rice, potatoes, and grains. If you have to ask, don’t eat it. Rule #5: Take one day off per week and go nuts. I choose and recommend Saturday." I've got Rule #3 down (I never drink anything but water). I don't mind Rule #2. Rule #1 isn't too bad, though I do love rice and potatoes ;). Rule #4, I understand and agree but I love fruit. So... thank goodness for Rule #5. I am hoping I can hold to the other rules knowing that one day a week (which will be Saturday or Sunday for me, depending on our plans for the weekend), I can indulge the cravings. I do make tweaks though... I had a handful of grapes with lunch, some nonfat Greek yogurt with breakfast, a small square of TCHO chocolate as a snack. Little things. So I may not lose 2 pounds a day ;) but I will hopefully also be able to sustain this. Also, I went for a walk yesterday with the baby in his stroller. It was only a 45 minute walk, and it was slow, and it hurt after about 10 minutes. But it was something. Well, this year hasn't gone as planned, with my overly optimistic post on January 1. Unfortunately, I am still recovering from the pregnancy and childbirth. It's been 10 months, but I still have a lot of pelvic, hip and lower back pain. I saw a chiropractor for about 8 visits but it didn't fix much. My primary care physician referred me to a new gynecologist and a new orthopedist, and both of those doctors ran tests and it's all muscle-related issues in those area. I've been going to physical therapy, but I'm still "broken". I start with a new physical therapist next week and follow up with my orthopedist a few days later. So I haven't been able to go for walks or go to the gym. It's frustrating beyond words. I desperately - desperately - want to lose weight, but I'm not able to exercise. I'm not eating well, which is totally my fault - I do have concerns about cutting my calories too much and ruining my breastfeeding. But that's no reason to not eat healthfully. My weight is depressing, quite frankly. My son is less than two months away from his first birthday, and I hate how I look right now. I don't want to look back on his first birthday photos and hate myself in them. I need to start putting some effort into myself. It's such a struggle, but I have to do it - not just for me, but for my son as well. Ah, the joy and pressure of the new year - it feels like a new beginning, but that's also a bit stressful that I feel like I *should* know how to get things started. I'm feeling a bit overwhelmed about it, given my past years of weight loss and exercise. I used to aim for the 10,000 steps a day, but I know realistically that is nowhere near going to happen this year with baby (and honestly, I don't even know where my pedometer is!). I weighed myself this morning and the number was, shall we say, not pleasant. I think my goals for this year will be best broken into monthly goals. When I'm done breastfeeding, I do want to go on a strict diet to re-kick my body into weight loss mode. But for now, for January - let's aim for 2 walks and 1 visit to the gym each week. 8 walks, 4 gym visits. Let's get started!